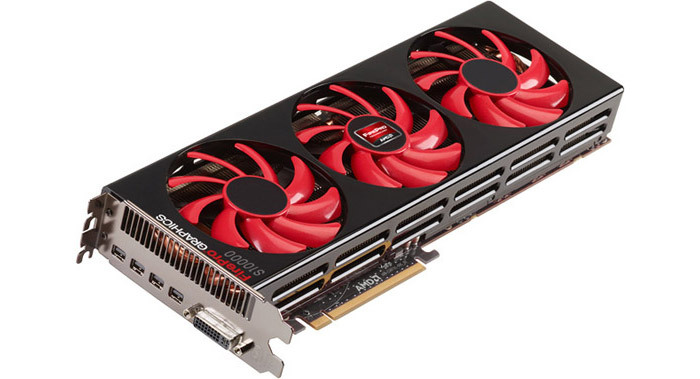 At the ongoing Game Developers Conference 2013 AMD has finally unveiled a prototype of the long rumored and highly expected dual-GPU Radeon HD 7990. The card, also known as Malta, has a black PCB and is based on a 28 nm Tahiti XT chip with 2048 stream processors and Graphics Core Next architecture. The HD 7990 prototype also has 6 GB of GDDR5 memory (3 GB per GPU) accessed over a 384-bit bus, two 8-pin power connectors, four Mini DisplayPort outputs and one DVI port. Memory clock speed is unknown but the GPU runs at 1000 MHz. In this configuration the card comes with TDP of 375 watts – a respectable number – that is taken care of a big dual slot cooler that integrates three smaller cooling fans. AMD should launch the HD 7990 sometime in H2 2013. The expected price for the new dual-GPU card sits at USD 1000.